This post contains affiliate links. This means that if you decide to click through and make a purchase, I might receive a small commission that helps me to keep the blog going. Thank you for your support. Before I went to Argentina I hated squid. It seemed rubbery and had no flavour. And then one night we were invited for dinner at my husband's friend Marcello's house in Buenos Aires and they accidentally put a tub of this next to me, on the table. I don’t think anyone else got a look in, it was so good. And don't underestimate kids - my eight year old daughter loves this. Squid has a bit of a reputation as being scary to cook, but it isn't at all. It takes just 1-2 minutes to cook in a pan of slightly salted, simmering water. Bring a pan of slightly salted water to a simmer on the stove. While that’s heating up, make the Provenzal dressing. 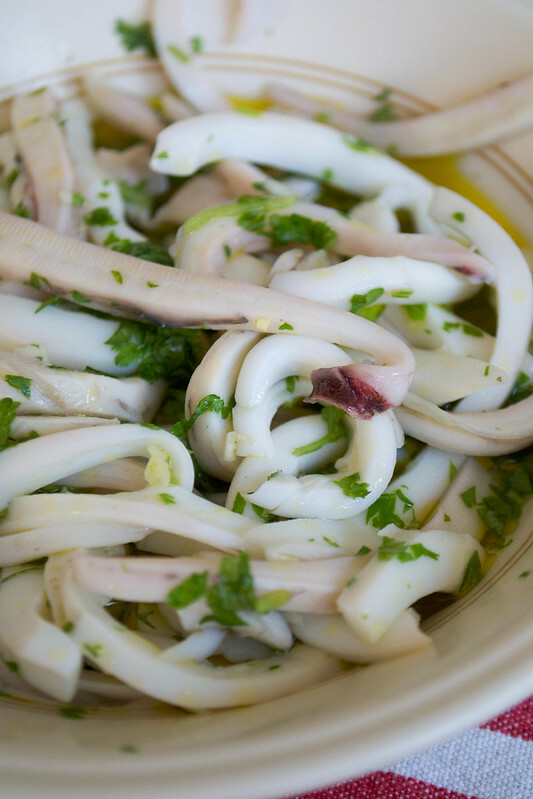 Combine the garlic, parsley, salt, oil and vinegar, if using, in a medium-sized bowl that’s big enough to fit the squid rings in later. Put to one side. Take the squid rings and gently drop them in the simmering water. Cook for 1-2 minutes - no more - until they’re firm and cooked through, but tender. Don’t leave the pan once you drop them in, it’s easy to overcook squid. Drain the squid rings and place them, still hot, into the garlic and parsley marinade. Stir to coat the squid well and leave to cool. Once cool, refrigerate until ready to serve. Best to allow the squid to come to room temperature for 20 minutes or so before serving, so the full flavours of the marinade can develop.